Today was a day of flexibility and surprises. We left prepared to continue building on Manuel’s house, but arrived to find there wasn’t any work really that we could do. 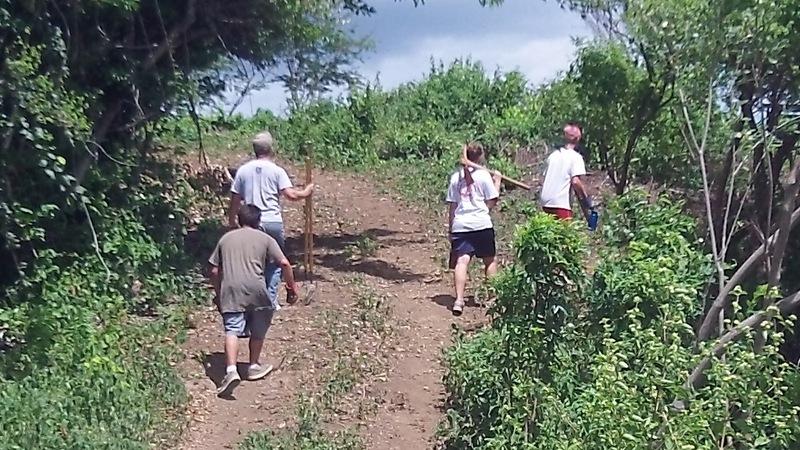 Our two Nica builders were doing some of the skilled labor of cutting and framing in the top part of the structure. This is a new style build for us – we typically are mixing a ton of concrete since we usually do all block houses, but the size of this house prevented it. So the top will be framed in wood and then we will add the siding and tin for the roof. So a group headed out to the school to gather some more kids and play on the playground and then I took a small group up to the top of the mountain – a tough hike with a great view, to clear a flat top that will one day hold an outdoor prayer chapel. It was hard work, but you really can’t complain with the amazing view. We cut down trees and cleared brush until we had a huge pile ready to burn. Off in the distance we saw some black clouds quickly moving our way and before we knew it they were on top of us. So here we are on top of the mountain with wind gusts of 50mph and then the rain comes. With nowhere to go, we hunker down in our brush pile as the sideways rain kicks in. Once thoroughly soaked we decided to make a dash (or slide) down the muddy trail – while being pelted with rain bullets. We made it to the bottom to find the rest of our team huddled up at the Ranch house. They made a run for it from the school playground, but were likewise pretty wet. All in all a great team bonding experience. And even being on top of the mountain in a pretty scary scenario, none of us experienced fear. Despite seeing God flex His muscle, we rested confidently in His care. So needless to say, the bus ride was a bit musty smelling and chilly as we road back to the compound. It took all of us a good while to get all the mud off and dinner never tasted so good! At our team time tonight we looked at intimacy through God’s love… how His love for us is the foundation of our relationship and the conduit for intimacy with Him. God is working – growing and stretching us in many ways. I’ve been excited to watch our students work, play and engage with each other and those in the community. God’s love is shining brightly through and we pray we are making a Gospel impact!